Description: Space galore! With 4 bedrooms, 3 full baths, a finished lower level & oversize garage & patio, this alluring, traditionally-styled two-story in monticello estates has plenty of room for everything. Entertaining is a breeze, with formal living & dining rooms, open kitchen/breakfast room/fireside family room arrangement & a lower-level recreation room with bar. The luxurious master bath features a window-lit, step-up corner tub, expansive double-bowl vanity & separate shower. Other special amenities include numerous ceiling fans; loads of cabinetry, a planning desk & breakfast bar in the kitchen; laminate wood flooring in traffic areas & spindled railings. Enjoy neighborhood activities at the community clubhouse, pool and tennis courts. 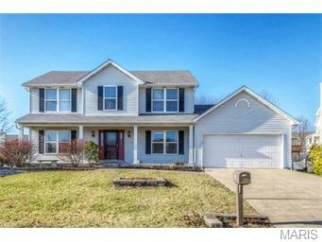 Plus direct access to i-64/40, hwy. 94, newly-completed hwy. 364 & the miles of shopping/dining/business facilities along hwy. K!